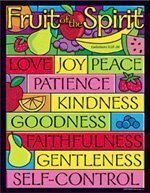 But when the Holy Spirit controls our lives he will produce this kind of fruit in us: love, joy, peace, patience, kindness, goodness, faithfulness, gentleness and self-control. But you, O Lord, are a God merciful and gracious, slow to anger and abounding in steadfast love and faithfulness. The word faithful means having or showing true and constant support or loyalty. In the bible verses above, it shows God’s faithfulness to us. If we choose to live a Christian life, we will be comforted in knowing that regardless of how worthy we feel, God will always be faithful to us. The Bible tells us to be faithful to God. The fruit of faithfulness is seen in our lives by our faithfulness to Him. We can show that faithfulness by worshipping, obeying God’s word and praying.